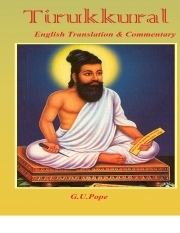 Description of "Thirukkural English Translation & Commentary (eBook)"
The Tirukkural or Thirukkural (Tamil Name: திருக்குறள்), or shortly the Kural, is a classic Tamil sangam literature consisting of 1330 couplets or kurals, dealing with the everyday virtues of an individual. Considered one of the greatest works ever written on ethics and morality, it is known for its universality and non-denominational nature. It was authored by Valluvar, also known as Thiruvalluvar. Reviews of "Thirukkural English Translation & Commentary (eBook)"